What a great DIY project idea for recycled frames. I ran across this mirror frame made from smaller bits of recycled frames today at the Anthropologie page while I was checking out their recycled eyeglasses necklace (causing quite a stir with its $498 price tag). I want to DIY something like this for myself, but now I’m having copycat dilemmas. Keep reading to find out why. It even comes in this super fun crate packaging that screams “DIY me when I arrive” – and is a bonus if you decide to purchase the frame from Anthro for $424 (yikes). As for me…I would prefer to try a DIY version for myself. I also shared it with Lucy at Lucy Designs because this is right up her alley – I’m sure she has a fabulous stash of old frames to chop up. I mean, have you seen her latest dragonflies??? Or her fun ‘EAT’ sign made from recycled frame bits? 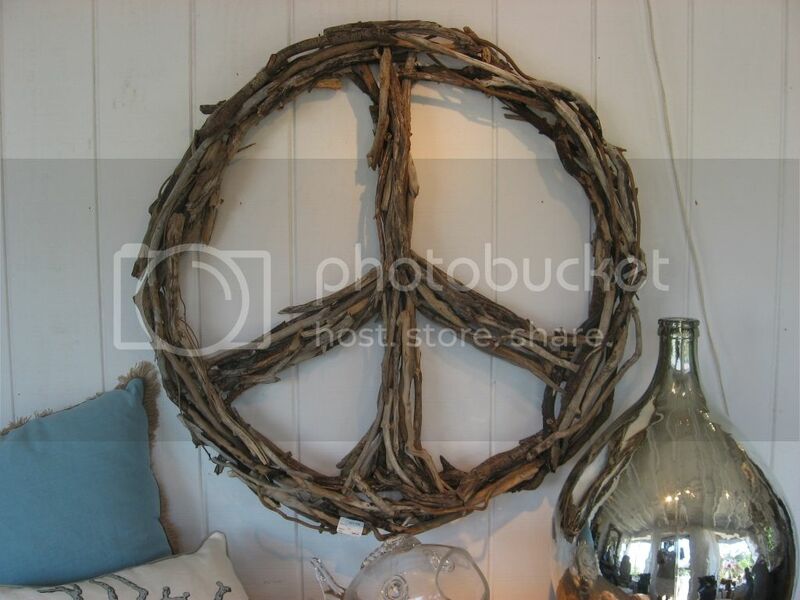 And there’s something about the layering of those little recycled frame bits that also reminds me of this ‘must try’ Peace sign made by Designs Adrift. I want to DIY both of these projects. I don’t know if I ever will, but I have certainly added them to my Pinterest ‘must try’ board. Have a look at the board if you need a good laugh today…like there is any chance I’ll ever get to all these projects! Do you have one of these boards, too? Now here’s where my dilemma comes in. I’ve been seeing a lot of blog posts lately about ‘copying’, like this article titled “Making It Your Own”, or this one called “Copycats & Copyright”. I would guess that I’m not alone when I say I’m inspired by seeing the creations of others. Sometimes I can just sit back and enjoy, blissfully knowing that I’ll never try something like that. Other times I am moved into action and want to try my own version of something I’ve seen. I do it for my home or for my friends. I don’t sell my creations. Yet. It doesn’t mean I won’t in the future. So my question is, does this make me a copycat? Am I breaking the cardinal rule of the handmade community? I’m really curious to know what you think on this subject. Is it okay to take inspiration from others to DIY your own? And where is the line drawn when it becomes ‘copying’? Aren’t we all inspired by something else? Are there really ‘original’ ideas that did not spring from some source of external inspiration? Yes, I think I will try both of the projects above. I also want to try one of Lucy Design’s dragonflies. She sells her dragonflies, but she also shares her how-to tutorials now and then – something I really admire. And when I approached Designs Adrift directly to ask a bit more about his process, he was happy to share. So what makes these artists (both sell their creations as a living) so willing to share, where others are uber protective of their creative process? As for Anthropologie’s $424 frame, I don’t feel bad for DIYing that one – because I’m quite sure that they already took their inspiration from somewhere (someone) else. We should all be inspired to make our work our own. Hey! – that's the real fun part. However, I do agree with greenbabydesigns affirming, "there is nothing new under the sun." I was recently called out on a copyright infringement when I had never seen the other person's work. I just must have had the same idea she had. With so much sharing either by posting photos or DIY videos it is really hard to consciously figure out where one's ideas originate. I believe that the maker knows if they are copying an object when they make it. If they knowingly do so and try to pass it off as their own then bad karma is a brewin'! Move on, change it up, be creative, take it in a new direction and enjoy the thrill of completing a piece that is truly your own. I think as long as you change it up and make it your own version…and give the proper credit, then go for it! I saw that exact same frame in the store and took pictures of it on my crappy phone in hopes that I could recreate it. Their pricing is so crazy! If it were reasonable, I would buy one myself. Hope you post yours if you do make one! Thanks for the mention Mike! I agree completely with what some have already said…I think it's hard to find completely original ideas since inspiration can come from everywhere..including peoples projects and ideas. I am a professional artist who obtains inspiration everywhere – often from other artists and craftspeople – and I always give credit to the inspiration, whether it is a landscape, a book, or an image. I strongly encourage everyone to do and create themselves; this gives us all appreciation for those who make it look effortless (because it isn't!) I give tutorials on my blog because I know that even if someone tried to copy something exactly, it would never look like my work. I also believe that sharing is empowering and gives people a positive attitude towards artists. That being said, I do think it's not very nice (and usually not legal) to make something just like another artist's and sell it as your own – give credit where credit is due, and definitely learn about copyright laws! There is nothing new under the sun. Crafts, styles, etc all seem to cycle back around. For years designers have gathered inspiration from all sorts of sources. Does that make them copycats? I put tutorials on my blog for people to use–if they want to make and sell, go for it! If you don't want to share, then don't put it on the internet, for Pete's sake! I do feel you should put your own personality and twist on your projects, and not copy EXACTLY and call it your own. That's not cool. Thanks for the thought provoking post! I felt like the Copycats and Copyright article was very empowering and informative; the Make it Your Own article flooded me with the old (art school) feelings of competitiveness, suspicion, ego etc. I love the idea sharing that goes on in this blogging community. I don't feel it is "fair enough" if someone decides to apply one of my tutorials or try to replicate something I made… I think it's great. That's why I'm sharing it! I am so flattered and even excited when I see one of my blog posts pinned. When big corporations profit from an artist's idea and don't attribute credit or give financial compensation: that's out and out wrong. Isn't imitation the sincerest form of flattery? And if you didn't want to inspire people to try it themselves, why would you put pictures of it out there for everyone to see? I'm not 'crafty' but my perception of the community is that there's a code – "if I can do it, you can too!" I don't think that makes you a copycat – I think it makes you a kindred spirit!